WHEN the RUC was disbanded in 2001 and replaced with the PSNI more than 5,000 officers collectively benefitted from a £500m severance package. However a new report by Northern Ireland Auditor General Kieran Donnelly has shown that nearly one in five of those who took the Patten severance package were later re-employed by the PSNI as civilian workers. In total the PSNI has spent £106m hiring `temporary’ staff via one employment agency since 2004. 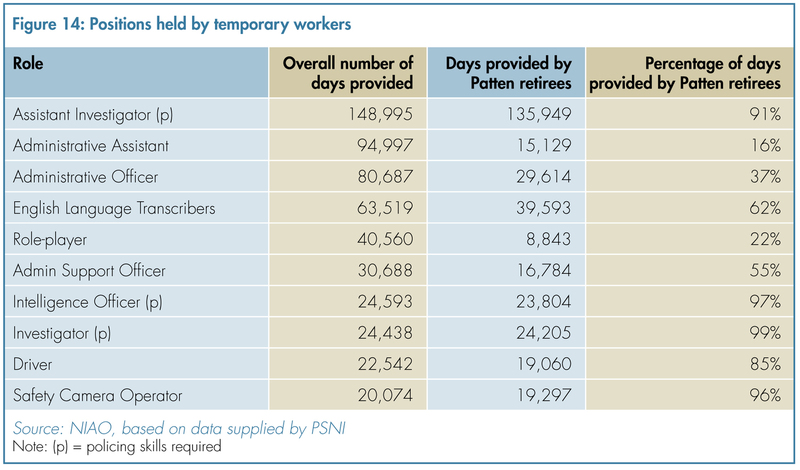 During the last decade some 2,740 agency staff have accounted for 1.5m working days inside the PSNI. That 63 former police officers employed by the Historic Enquiries Team are contracted via limited companies, a well-known tax-avoidance route. The majority of former PSNI officers were re-employed a year after leaving the force. 1,071 former PSNI officers who were re-employed as agency workers accounted for more than half of the overall figure, being employed for an average 779 days – almost twice as long as `civilian’ agency workers. However 54 were re-employed within one week; 19 were taken back the day after they left the PSNI and two were re-employed even before they had left. But the length of period which former officers were employed by the PSNI as agency staff has also raised concerns. Auditors found that 166 former officers were employed for more than three years; 37 for more than five years and four longer than seven years. While some of this work involved investigative police work, the majority was administrative, driving and transcribing. However while the auditor general found that the PSNI was justified in its use of agency staff, he was critical of the lack of effective procedures employed by senior police management to ensure proper accountability and best value for money for the taxpayer. In the first three years after its formation the PSNI used three employment agencies to recruit temporary staff. However this was abandoned in 2004 when it decided, with approval of the Northern Ireland Office, to only use Grafton Recruitment Agency. The PSNI claimed this was done to reduce costs but instead it led to Grafton’s contract rising from £2m to £18m by 2008. However auditors found that no costings for the contract were ever produced. In fact auditors found more than £44m in fees and salaries was paid to Grafton for temporary staff in just four years, before any competition process for the contract was ever put in place. Auditors found that the change to the Grafton contract had been signed-off by a PSNI Recruitment Manager. The manager was only authorised to approve contracts valued at up to £100,000, but auditors found that the increase in the first year alone of the Grafton contract had been £4.6m. 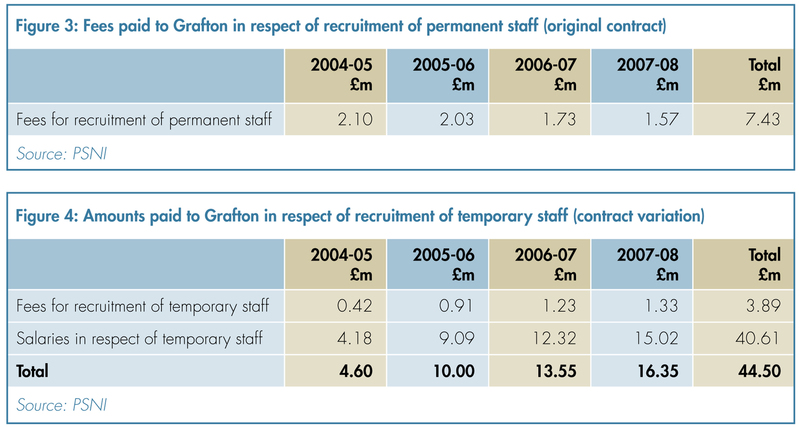 In 2007 Grafton tendered for another four year contract to supply more agency staff to the PSNI. While Grafton’s business case for the potential contract included £5.4m in fees for agency staff, a further £57m relating to salaries (representing more than 90% of the overall costs) was never included in the budget. In March auditors discovered that the PSNI was paying 64 agency workers through the use of limited companies, a well-known legal tax avoidance route. 63 of the 64 temporary staff being paid by the PSNI through limited companies are employed by the Historical Enquiries Team (HET). The one remaining individual was employed by the PSNI’s Crime Operations Department. The audit report showed that the PSNI blamed the Department of Finance, Northern Ireland Audit Office and Her Majesties Revenue, Customs & Excise (HMRC), who it claimed had provided “no central guidance” to the force on the use of limited companies. “Public sector organisations should avoid using tax advisors or tax avoidance schemes as any apparent savings can only be made at the expense of other taxpayers or other parts of the public sector”. Both the Policing Board and NIAO asked the PSNI for information on the former occupations of agency staff. Auditors found that in many cases, agency staff had not been hired to fill any specific vacant post within the PSNI. Instead, temporary posts appeared to have been created as opportunities to provide skills that local police commanders felt were necessary. Auditors found that by March 2007 the use of agency staff “appeared to be out of control” with almost 700 employed by the PSNI. Many posts were not subject to adequate evaluation. A review of one PSNI department identified how more than half of agency staff were being paid at a higher grade than the post warranted. Despite this the PSNI declined to carry out an overall review of overpayments to agency staff. However auditors found that prior to 2011 the PSNI had no corporate policy or procedure governing the employment of agency staff with decisions being taken at local discretion. In 2007 agency staff employed in PSNI command outnumbered permanent staff by 2 to 1. Auditors were unable to review financial data prior to 2005, as the PSNI has a policy of routinely destroying papers after seven years. Changes in employment regulations meant that some temporary staff who had been recruited by Grafton before the legislation was introduced became known as “associates”. The cost to the PSNI of employing “associates” was 10% over and above the normal rate of employment of other temporary staff. However the NIAO expressed concern that to date the PSNI has failed to carry out any equality impact assessment of its continued use of `associates’. The Police Ombudsman has also expressed concern that he cannot investigate complaints against civilian staff who work with police officers in the course of their policing functions. Mr Donnelly said there was clear evidence that the PSNI had reduced its reliance on agency staff over the last five years, with numbers decreasing from around 800 in 2007 to 400 by March 2012. The majority of that reduction took place during a six month period last year when, following high profile political criticism of the number of agency staff employed by the PSNI, the number was reduced from 647 in April to 372 in August. However Mr Donnelly warned that continuing financial pressures meant that the PSNI would continue to rely on the use of agency staff. Despite the significant reduction in agency numbers, former police officers still make up three quarters of the 400 temporary staff currently employed by the PSNI. Former police officers make up two thirds of temporary staff employed in the command unit; 92% in Crime Operations as well as 56% of temporary staffed employed in HET. “Given the unprecedented loss of skilled and experienced officers, there remains a business need for temporary staff,” Mr Donnelly said. “That some of them should bring policing skills with them also appears necessary. “Temporary staff offer value for money but their use needs to be properly managed and controlled.